What could go better with wieners than a flying space circus? Nothing! Which is why Humphree’s all jazzed up at the chance to sell Galactic Hot Dogs as the official food of Crostini’s Cosmic Carnival and Wonder Circus train. Cosmoe’s not entirely convinced—but once his skills as a monster tamer are unveiled, the deal is done and the Neon Wiener is officially hooked onto the train. Only things aren’t quite what they seem at this circus, and pretty soon Cosmoe realizes he and his buddies are in more danger than ever. To get to the bottom of it all, they have to travel somewhere pretty familiar, providing a glimpse at last into Cosmoe’s past and how he ended up aboard the Wiener in the first place. Max Brallier is the author of more than twenty books for children and adults, including tie-in books for the popular show Adventure Time and the acclaimed Can You Survive the Zombie Apocalypse? He lives with his wife, Alyse, in New York City, where he spends his time chasing fortune, glory, and the perfect hot dog. Rachel Maguire is an award-winning illustrator and animator. She teaches comics to children, and lives in Massachusetts with her husband, Jon, and her cat, Becky. Nichole Kelley does not like to define herself as any specific kind of artist. In the past she has worked professionally as an animator, illustrator, and designer. This combination has allowed her to work on a variety of awesome projects, including web animation, casual games, console games, board games, and children’s illustration. In her free time she enjoys video games, board games, toys, crafting of all sorts, and sleeping. Her latest venture is learning how to make glass beads and marbles. 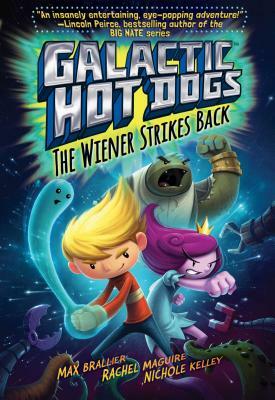 "Readers of “Diary of a Wimpy Kid” and those still obsessed with all things Star Wars will enjoy this silly romp through space."